Kevin Smith (Haffenreffer Museum of Anthropology at Brown University ), Neil Peterson and I have been discussing the work Kevin has been doing excavating a Viking Age iron smelting site at Hals in Iceland. The site is an 'industrial' one, composed of a large number of smelters that were operated from roughly 875 - 950 AD. 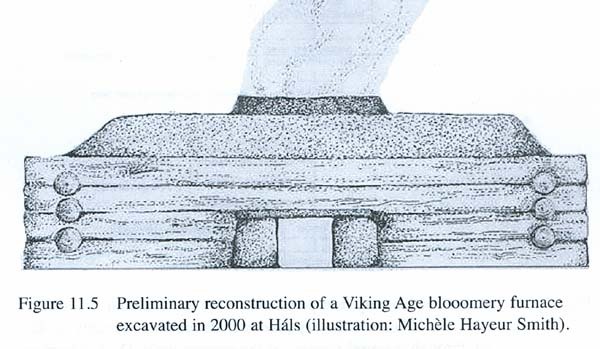 The details can be found in 'Ore, Fire, Hammer, Sickle: Iron Production in Viking Age and Early Medieval Iceland' (Smith, 2005). In any consideration of this evidence, it must be remembered that the site has only been partially excavated an the remains not examined in close detail at this point in time. 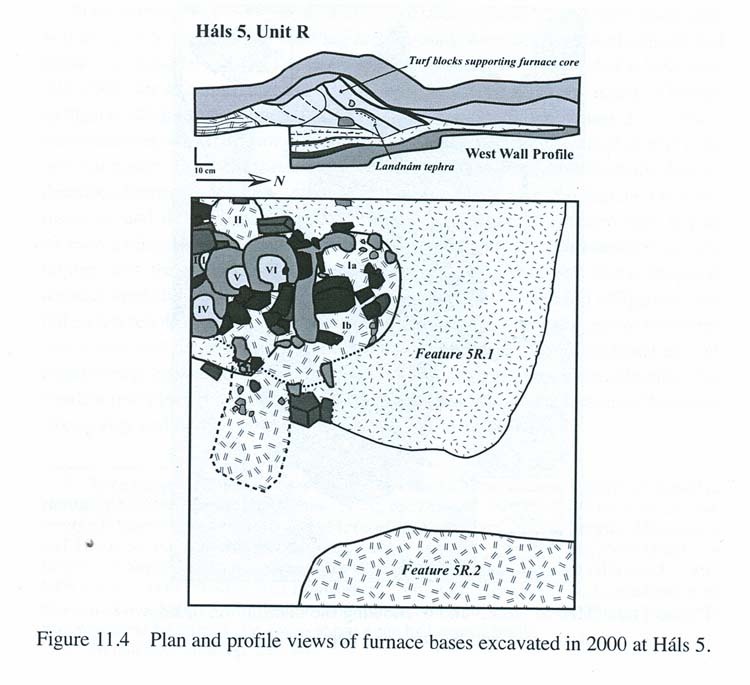 The long range plan is for our team to work towards a full historic reconstruction smelt using the Hals excavations as the model. - Basic construction was a conical stack of cut grass sod strips contained in a box frame of timber. - Overall dimensions are roughly 2 x 2 m by 1 m tall. 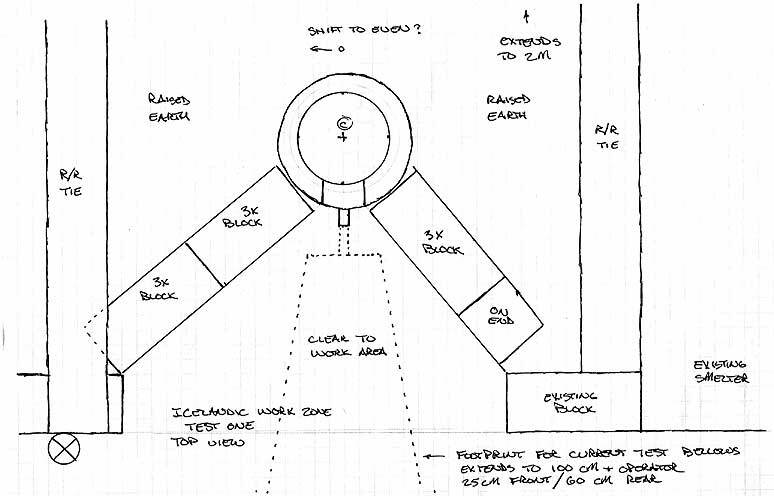 - The space between the cone and the box is back filled with earth to create a working platform. - This shaft is then lined with a relatively thin (C) layer of clay like material (D). - A working area at the front of the furnace would either be a tunnel or a slot (E) cut into the overall frame. - A 'blow hole' method appears to have been used to introduce the air (H). One proposed layout for the furnaces at Hals based on the remains. 2) Height of stack above tuyere > 40 cm. The archaeology shows the stack of grass sods extending roughly 1 m to each side of the furnace shaft, with the current angle of these sods at roughly 30 degrees. 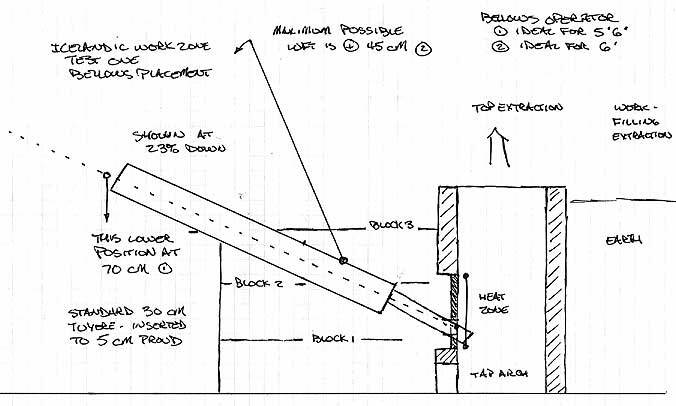 Extending that angle for a 30 cm diameter shaft within a 2 x 2 m framework produces a total stack height of 60 cm. It is more likely however that the position of the sods has slumped slightly over the centuries from their original position. Using a 35 degree angle the resulting measurements (as calculated) easily allows for a total stack height closer to 70 cm, or 50 cm above the tuyere (with a 20 cm base distance). Extending a possible stack angle to 40 degrees, the total stack height extends to 80 cm, or about 60 cm above the tuyere. We have found in past experiments that at stack heights over 60 cm above the tuyere there can be an increasing problem with excess absorption of carbon into the metal. 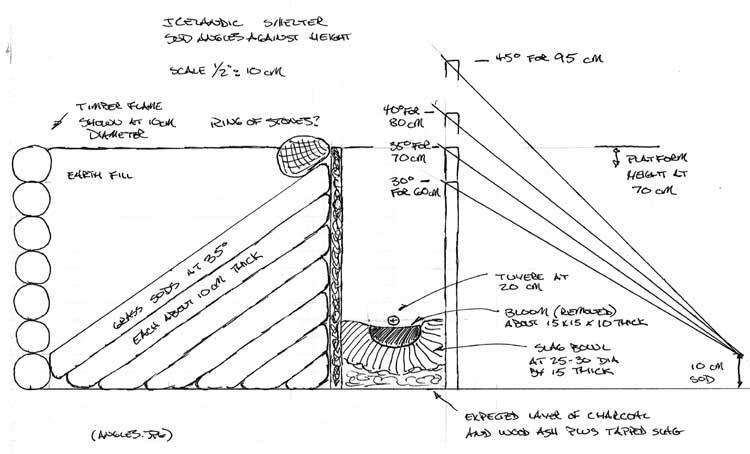 Extending the sod angles to 45 degrees increases the potential stack total to 95 cm, or 75 cm above the tuyere point. In light of the potential problems this would create, both in difficulty in construction and smelt carbon control, this extra height is not considered likely. For the reasons detailed, it is suggested that the original construction would have used a stack angle for the grass sods of between 35 to 40 degrees. With an interior dimension of the shaft at 25 cm, these stack height estimates would increase slightly. B) This working diameter is indicated by the diameter of the slag bowls found. 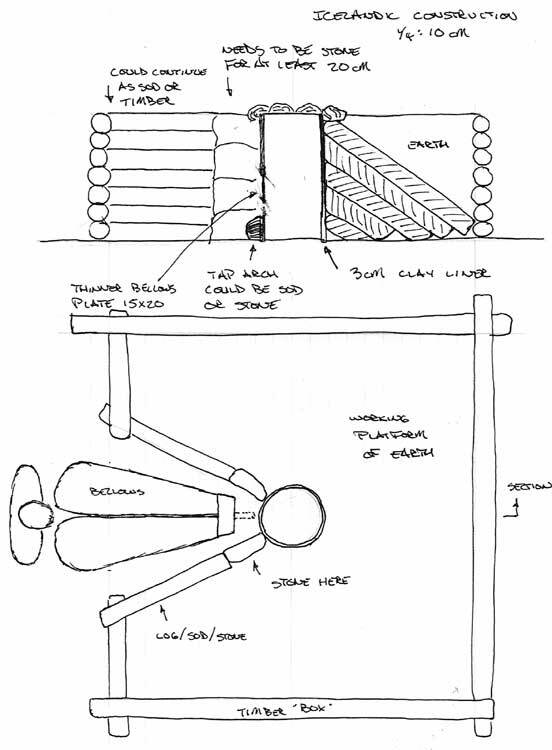 Our own experience has centred around furnaces in this range, typically 25 - 30 cm diameter.It should also be remembered that both the air system employed and the dynamics of whatever bellows was used can seriously impact on how effectively a furnace of a given diameter may perform . (see G below). The larger 35 cm diameter indicated may present significant problems in generating the required air volumes. 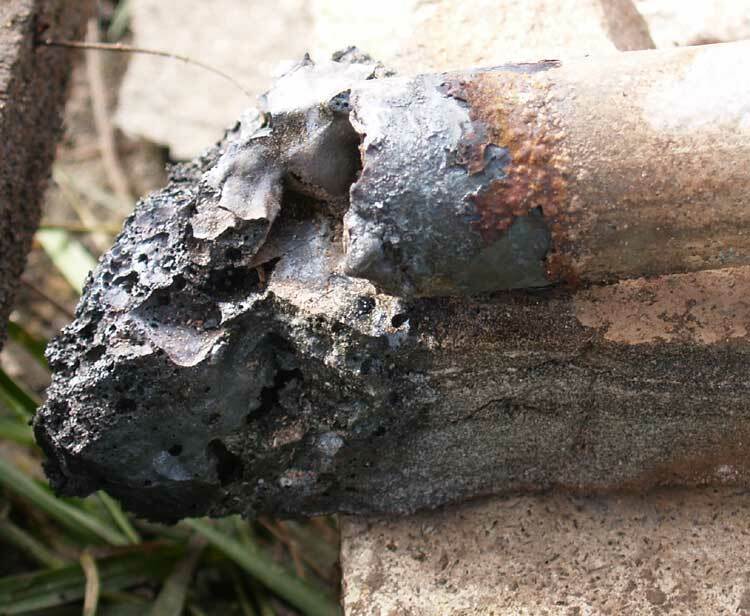 Sauder & Williams have determined that the air volume required for a successful smelt is roughly 1.2 - 1.5 litres per minute for each square centimeter of the shaft at tuyere level. ("A Practical Treatise on the Smelting and Smithing of Bloomery Iron" - 2002) Our own experiments have confirmed this requirement. 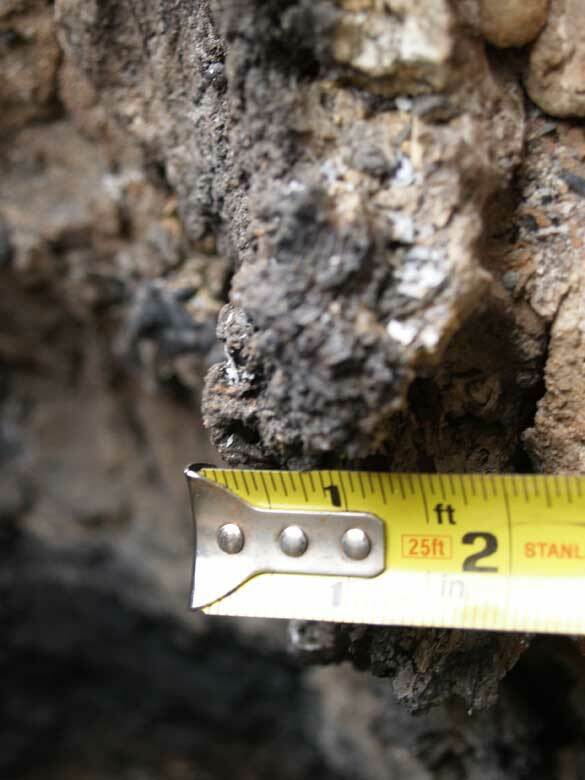 C) A wall thickness of approximately 3 cm has been suggested by remains of furnace wall. Unfortunately these remains are fragmentary (from centuries of freezing and thawing). The construction style at Hals uses the sod to give the support to the structure, so the clay is operating primarily as a fire proof layer. There will be some minimum thickness required to balance the erosion effect of the high smelting temperatures (in the range of 1300 + C). Our experience has shown that thin walled structures will radiate off excess heat to balance erosion effects. In this case however, the enclosing sod structure will not allow accumulated heat to radiate, so erosion may prove a significant factor. The fact that the furnace shafts are cylindrical also strongly indicates the use of a clay liner. If the locally available stone was used for creating the fire proof layer, the resulting furnaces would have square shafts. There would also remain considerable amounts of large stone pieces with heat damage, slag layers and significant erosion effects. The resultant slag bowls would also exhibit distinctive shapes, most likely a D shape overall. D) The exact composition of the wall material is unknown at this point. (see also C above.) Smith has discovered that true clay is available locally as deposits within certain hot springs. (This clay was tested by Michelle Smith and found to fire to a hard porcelain like texture.) At this point the original wall material from the site has not been analyzed in detail.  It is thus unknown what, if any, organic materials may have been added to the base clay. Our own experience certainly has shown the utility of adding chopped straw to the clay used for the thicker walled furnaces (7 - 10 cm). With this mixture, when the clay is initially heated, the steam generated (from working with wet clay) vents both into and through the hollow straw, reducing cracking (even preventing steam explosions!). During the main smelt sequence, the straw acts as a structural element on the outer surface, holding together the walls against cracks. On the inner surface, where high temperatures sinter the clay, the straw burns away, leaving air passages that both insulate and spread heat. For thinner sections, I have been guided by the work of Michael Nissen (Ribe Viking Centre) and tests with Skip Williams and Jake Keen. Mixing dried horse manure with the clay greatly improves its heat resistance, but leaves a much finer texture. Nissen constructs the heavy walls of his earth banked smelters of this mixture with good results. This material is far less porous than straw cobb and thus likely more durable under the freezing and thawing cycle (although this has not been field tested). - There is considerable heat vented from the tuyere / tap arch segment of the furnace wall. This precludes the use of wood as a roofing material for a tunnel. - Any manipulation of the developing slag bowl (tapping) or clearing obstructions from the air intake would be extremely difficult, if not impossible, if forced to work down the end of a long narrow tunnel. 1) The raw size of the bellows is based on a theoretical construction that allows for high volume air production. (More information covering this reconstruction can be found as part of the discussion on 'Hammered Out Bits', specifically "Bellows Reconstruction 3") Our own tests of a bellows unit of the size indicated suggest it should easily produce consistent air volumes in the range of 600 - 750 LpM. 2) With the bellows set in line to its air output tube, itself set to our normal 23 degrees down (an effective value determined by repeated experiments), the working end is raised to a height that is perfectly comfortable for an operator of average stature when standing. What this arrangement does not account for is how the bellows is actually supported in the correct position. The simplest solution would be to mount the bellows on a heavy frame, which is how we have tackled the requirement in the past. The use of such a frame creates a problem in that it greatly restricts access to the tap arch. One solution would be to use horizontal timbers attached to the larger wooden frame around the smelter to support the bellows. It is noted that it might have been possible to use some form of piping to channel air to the furnace from a more remotely situated bellows. Heavy leather or hollowed out branches would certainly work for this, and yet at the same time leave no traces behind. F) Although the working portion of the structure could be framed with large stone slabs, the archaeology does not fully support this. There were a line of roughly 10 x 15 x 3 -5 cm thick stones found in a V leading towards the location of the tap arch / tuyere combination (Furnace 6, the uppermost and last in the series). These stones are a bit on the small size to support a roofed over construction, especially since much larger slabs are easily available close to the site. 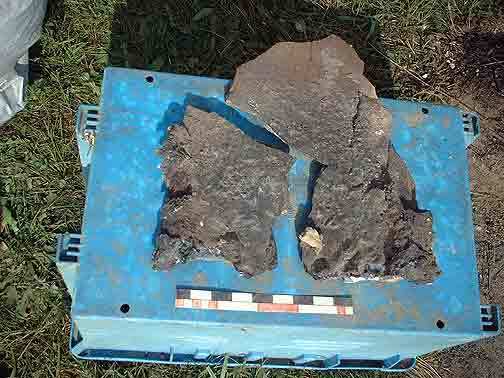 (It should be noted that to date no large slabs have been recovered at the site. Stones tend to fragments, with the largest about 15 x 25 x 15 cm.) A simple grass sod wall would certainly work effectively to support the walls and be suitably fire resistant. The upper section of the front smelter wall could be made of a single large stone slab if suitable clay was not available. Although a suitable sized stone could have been used to support and plug the tap arch, experiments have shown that a cut block of grass sod (laid upside down) also works quite well. The underlaying principle behind the use of a bellows plate relates to the heat distribution within a working smelter. A zone of extreme temperature will be created in a rough oval located around the air inlet. Typically this zone extends from 1/3 bellow to 2/3 above the air inlet, and symmetrical side to side. For smelters in the size range and with air flows as under consideration here, that oval extends roughly 15 side to side and 20 cm top to bottom. A thinner plate inset to the inner surface of the smelter will disappate heat rapidly enough to balance the heat from the furnace. The bellows plate may be used with either an insert tuyere or with the blow hole method of air delivery. The blow hole method employs a hole cut into the bellows plate. The usual practice for current experimenters has been to size the hole to allow for about 1 cm clearance around all sides of the air tube used. The air outlet pipe is actually set back 6 - 10 cm from the hole. This distance, plus the cooling effect of the air blast, means that even organic materials such as wood can be used without danger of overheating. In effect, the air blast creates a venturi effect, which actually draws significant amounts of the surrounding air into the furnace along with that supplied by the blast itself. One draw back to this method is that although air volumes are increased, the effective pressure of the blast is reduced. This can mean that the air does not penetrate as far into the body of the furnace, significantly changing the working dynamics inside the furnace. One clear advantage, especially significant with human powered equipment, is reduced labour required by the operators to generate the required air volumes. One small fragment of clay wall material bearing the partial outline of a potential blow hole has been uncovered at Hals. If this is what the fragment represents, the indication is for a hole diameter roughly 4 - 5 cm. With the usual 1 cm clearance, this would suggest an external diameter of 2 - 3 cm, certainly within the range possible if a metal tube was employed. Michael Nissen has reported on his use of a tapered iron (mild steel) tube. He has good results with a air pipe outlet diameter in the range of 1.5 to 2 cm, working in concert with a blow hole in the range of 2 to 4 cm. This hole diameter in the bellows plate is based on a number of finds he has examined in Denmark. 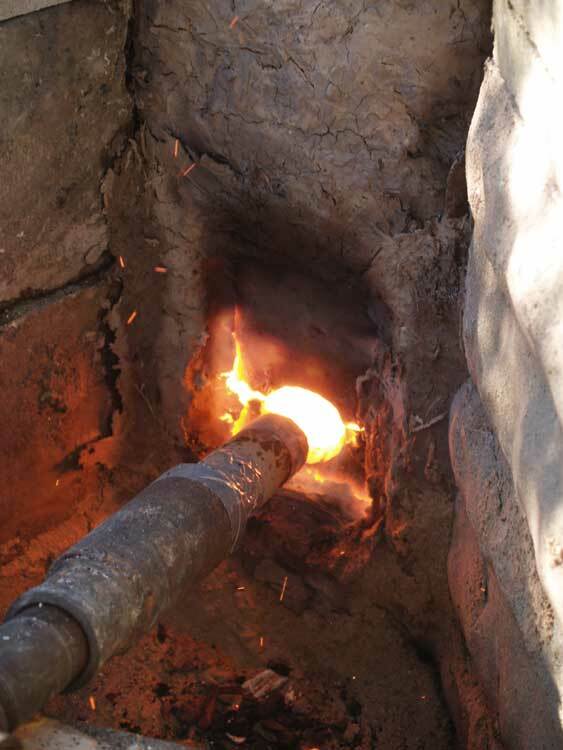 (I) The experience of all those involved in experimental iron smelting has shown the clear relationship between ore and smelter design and operation. Determining the exact chemical composition of the ore used originally at Hals is thus extremely important to a correct full reconstruction. The team is confident that the recent work on the DARC Dirt 1 bog ore analog will prove of great value in matching the chemistry once it is determined. 1) The physical dynamic of working from up on top of a platform with the smelter effectively at 'floor' level is not expected to present a major challenge. During the building phase, the creation of the inner clay liner is expected to be more difficult. The lower portions will have to be accomplished working laying down and at full arms reach. (The smelter extends at least 60 cm, and normal arm reach is only about that same amount.) During the main operation of the smelter, adding charges of ore and charcoal are not expected to deviate too much from established practice. At point of extraction, the operators will be standing directly above the hot furnace, with their entire bodies exposed to the extreme temperatures. Effective reach will again become a major factor in effective removal of the hot bloom. 3) The use of a hand powered bellows is not expected to be a major problem at this point. A full test is more about labour organization than air delivery effect on the smelt. A simple short duration test of the current bellows design with a series of operators suggested that the average air delivery would be in the range of 650 - 700 litres per minute. This compares with the expected air requirements (Sauder & Williams plus past experience) between 580 to 880 litres per minute (for a 25 cm interior diameter). 4) Use of the thin liner should represent a major test on its own. We will have to substitute a ball clay for marl (as we can't easily get any marl / 'glacial blue' clay). The evidence from Hals does not appear to give us either the specific thickness, or composition of the suspected clay liner. Kevin Smith has suggested 2 - 5 cm wall thickness. At this measurement, the horse manure mixture is likely to perform better than our standard clay with straw cobb. We can expect increasing fragility and reduced durability (erosion effects) as the clay layer is reduced in thickness. 5) The overall work dynamic of the Icelandic smelter is the easiest thing to test. Within the normal working area at Wareham, the overall layout can be simulated out by digging a key hole into the side of the existing pond bank. This would let us use the upper ground level as if it was the top of the sod construction, blocking out the 2 metre square working platform. This would require us to undertake all the physical adjustments to the smelt bowl working down a roughly 1 m long slot. The position of a man powered bellows can be indicated by placing a plywood cut out on to the existing heavy frame (from the failed 'Obberbellows'). With a new construction, it will be simple to provide for a loose sand surface that will provide a record of work and debris patterns. 6) One major shift from past experiments is the placement of the tuyere directly above a small tap arch. 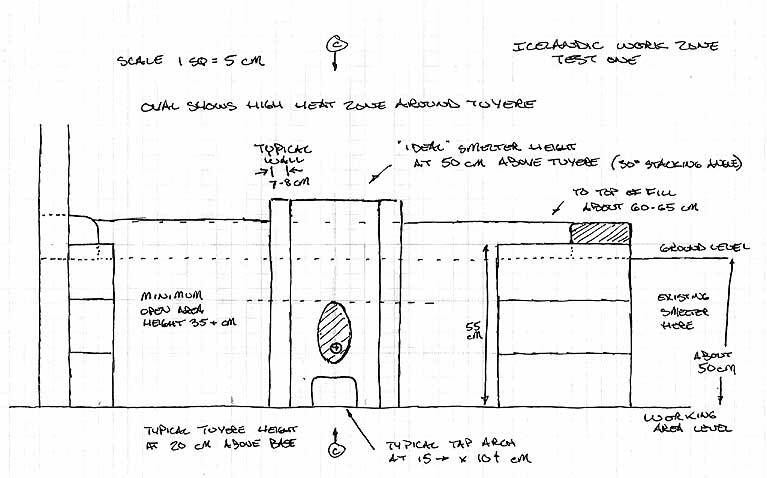 (The normal layout has been with the tuyere set at right angles to the tap arch, typically to the right hand side). This change in itself is not expected to create any significant problems. 7) There have already been two experiments with stone slab construction (the Thanksgiving and Fall smelts of 2007). For the first of these we did try to use the 'blow tube' style tuyere (tuyere set back from blast hole), but with poor results. The use of a stone front on the smelter (or entire stone construction) itself has been tested to success. 8) The use of a separate clay bellows plate represents an archaeological question at its core. Again, there appears to be no specific artifact evidence, but that should balanced against the relatively fragile nature of these plates. A number of smelts (mainly Nissen) have shown that a roughly 15 x 20 cm by 2 cm thick plate of dry horse manure mixed 50 / 50 with clay works extremely well. 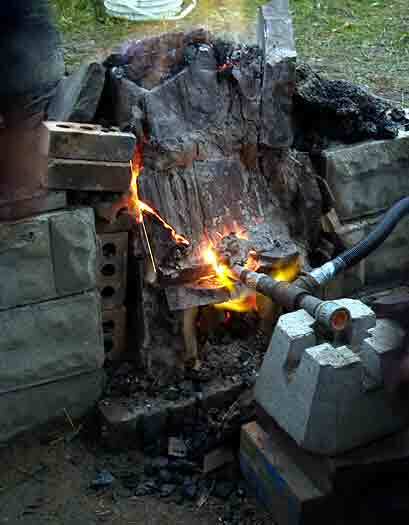 The second piece of this method is the set up with the tuyere actually sitting proud of the smelter wall. I did use the combination of bellows plate (thin plate around tuyere entry) with blow tube set up at Smeltfest 08 for two smelts with good results. Also watched Michael Nissen do this three times in Denmark (2008). Overall, it should be expected that learning to correctly operate a furnace using a blow tube will present the most significant challenge in the experimental series. 9) Some continued refinement of the mix on the DARC Dirt 1 analog remains. Due to bad communications (and poorer math!) the actual iron content of the first round of test materials was really on the low end (at about 50 % Fe). It did match the St Lunaire samples, but ideally the iron content should be increased to something richer and more likely to give higher end yields. An effort should be made to get samples tested from the ore found at Hals so we can try to match the chemistry from Hals if at all possible.